From Guantanamo, to the NSA, to Syria, the president has repeatedly disappointed his base. President Barack Obama will have to deliver one of the finest speeches of his presidency tomorrow if he hopes to win Congressional support for a strike against Syria. Out of nowhere, the Syria vote has emerged as one of the defining moments of Obama’s second term. With three years remaining in office, the vote will either revive his presidency or leave Obama severely weakened at home and abroad. There are legitimate criticisms of Obama’s initial response to the Syrian government’s barbaric August 21st gas attack outside Damascus. The president should have demanded that Congress be called back from recess immediately. He should also have immediately made a far more personal and passionate case for strikes. But what may doom the president’s effort, in the end, is not his short-term tactics. It is years of contradictory policies and unfulfilled promises by Obama himself. As Charles Blow noted in the New York Times this week, this is the “Era of Disbelief,” where Americans don’t trust their president or Congress. Blow rightly cited Iraq as the primary cause. But a litany of other government half-truths have pushed the public’s trust in its government to record lows. Obama’s primary sin has been contradiction. On many issues related to the war on terror, he has broken campaign promises or adopted inconsistent positions. Obama is now asking Americans to trust him on Syria. But they do not. For the last six years, Obama has told Americans that the United States needs to extricate itself from the Middle East. He proclaimed a “pivot to Asia” — and declared that region far more important to America’s future than the Middle East. Iraq and then Afghanistan were countries that the United States should get out of, Obama declared. And never look back. For two years, a similar message was conveyed about Syria: stay out at all cost. 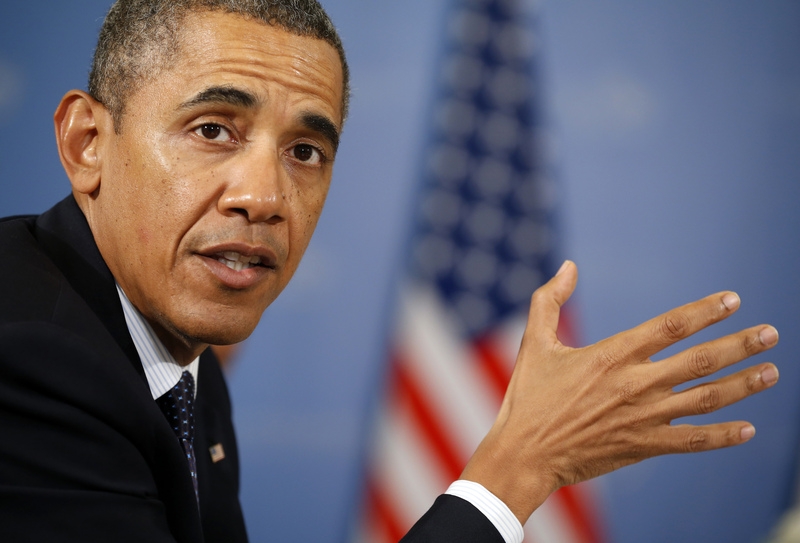 Now, Obama is telling Americans that attacking Syria is vital. Voters respond with a simple question: Why now? The chemical weapons attack was horrific, skeptics argue, but they say the administration has not explained why Syria now represents a national security threat to the United States. In a development that must deeply worry the White House, support for a strike from the Israeli government and the American Israeli Public Affairs Committee has so far failed to dramatically increase support in Congress. Conservative Republicans who normally shower support on Israel say sweeping opposition from constituents compels them to vote no. Distrust of Obama on the right, of course, is nothing new. Conservatives have reviled him for years. What threatens Obama is a lack of trust from his liberal base. Since he won re-election, liberals have expressed growing frustration with Obama’s national security policies. Hopes that he might change some of his positions in his second term have been dashed. Obama has made only a tepid effort to close Guantanamo Bay; insisted on cloaking drone strikes in secrecy, and strongly defended sweeping National Security Agency surveillance. The candidate that liberals thought would return the rule of law to the struggle against terror continues to embrace many of President George W. Bush’s practices. Obama has also contradicted himself on executive power. After steadily expanding the power of the presidency for the last six years, he abruptly decided to seek Congressional support for an attack on Syria. Again, Obama’s position is inconsistent. He is requesting congressional support for a Tomahawk missile strike in Syria but continues to argue he has the authority to maintain a “kill list” of people — Americans included — whom the president can target in drone missile strikes worldwide. There is no public review of the “kill list,” the legal rational behind it or standards of evidence used to determine who will die. While Obama kept his promise to pull US troops out of Iraq, he has disappointed his liberal base in Afghanistan. Instead of withdrawing American troops from the country in his first term, he carried out a surge of U.S. troops. In his second term, he continues to promise a pullout but talk of maintaining as many as 15,000 soldiers in Afghanistan as a “residual force” continues to circulate. Lastly, Obama’s response to the widespread NSA eavesdropping revealed by Edward J. Snowden has also disappointed many liberals. Obama said he “welcomed a debate” on surveillance — but then declined to reveal the extent of the programs or open them to public review. A similar disappointment exists overseas. Europeans who expected sweeping reforms of American anti-terror efforts are disappointed. The Snowden leaks have been even more devastating abroad than they have been at home. From Germany to Mexico, the NSA has been secretly eavesdropping on foreign leaders while insisting it was doing nothing of the sort. There is a chance that Obama will somehow win support from Congress. As I’ve written before, lawmakers should approve his request if it is part of a broader strategy to work toward a political settlement in Syria. The draft Senate resolution bars American ground troops from deploying in Syria and places a ninety day limit on how long any attack can last. And Obama himself has repeatedly said that he will not allow the US to be drawn into a prolonged conflict. In short, Obama is asking the American public to trust him. In a rare moment of unity, Americans on the right and left are saying they do not. The president has engaged in one contradiction too many.